Since Monster Games resumed working on officially-licensed NASCAR titles back in 2016 after a 14-year hiatus, the NASCAR Heat franchise has slowly been getting back up to racing speed. Now, with two current-gen titles done and dusted, you’d expect a third title in the series to have dealt with any major problems and be fighting it out toward the head of the racing pack. Even before the green flag waves on the track, it’s easy to see that NASCAR Heat 3 brings with it some promising features to help with its attempted advance through the field. Most notable is the expansion of the game’s career mode, which now provides much more depth than before. 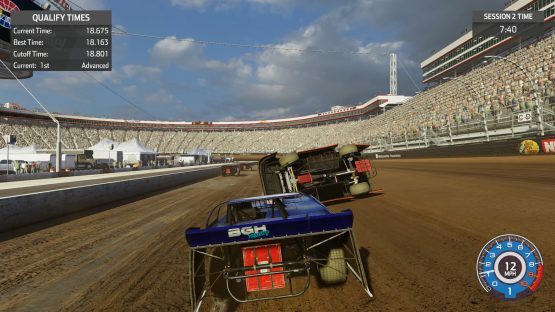 Starting out looking for hotseat rides in the fictional “Xtreme Dirt” racing series, you’ll be slipping and sliding around some entirely fictional sand and mud tracks, as well as some dirt versions of real-world courses. After a few hotseat drives, you’ll be able to sign a contract with a team for the following season or create a racing dynasty from scratch. As is the case with many facets of NASCAR Heat 3 though, team creation options are somewhat limited. Pick from a handful of predefined logos, names, and numbers, choose a sponsor, pick paint colors, then watch as your sponsor’s logo isn’t even placed anywhere on your car. So, however much you want it to be the case, your dream Red Bull-sponsored car #39 from Team xX_SuperBlazeItBadBoyRacing420_Xx isn’t going to be making its way to the starting grid any time soon. Once you’ve laid out your look, you must head into the garage to work on your vehicles. Three different chassis types are available, with each being suitable for different types of track. Employees can be hired, trained up, and set to work on boosting each car’s stats, while larger upgrades can be purchased with your team’s winnings or with money you’ve earned from staying active as a hotseat driver for other teams. To be perfectly plain, you don’t have a choice in the hotseat situation. You run one team in one championship while randomly being given drives for another in another championship, with no option to skip those races and focus on your own team. You can’t even get around it by starting the race and then retiring, as there’s no option to do that. With the money pouring in at the rate that it does, it doesn’t take very long before you’ve got a garage full of machinery that should be able to light up the track and claim a cup or two. You’d expect to be able to hire a teammate to run a second car once you’re up and running, but again, NASCAR Heat 3 doesn’t give you that option. No slingshot moves for you. On the track, whether you’re competing in that Xtreme Dirt series or one of the three real-world championships—the Camping World Truck Series, the Xfinity Series, or the Monster Energy Cup Series—you’ll notice the pleasing visual upgrades over last year’s effort. These do come at the expense of a stable framerate, however, with many courses suffering judders and jumps. A few circuits even have a bizarre effect where it feels as if the car is running at the full frame rate, but the track is running a few frames slower. As bad as they sound, these issues somehow aren’t massive game breakers. Indeed, if you overlook the judders and glitches for a while, the action can be compelling stuff. Sometimes you’ll feel a real rush, especially when you’re tearing toward the line at Daytona, with the sound of the engines blasting away, and your engineer calling out your spots over the DualShock 4’s speaker with impressive regularity and detail. Slight disappointment reared its head for me when that engineer shouted “OK, it’s hammer time! Let’s go!” and I realized all my parachute pants were at the dry cleaners, but these things are sent to try us. Unfortunately, that isn’t the only downer when you’re behind the wheel. There are quite a few of them to be found. Just as you feel like you’ve learned your marks and mastered your speeds after a few dozen practice laps, a plethora of rough spots show up to knock the shine off NASCAR Heat 3’s apple. It might be an AI driver randomly turning directly into traffic from the pit lane during your blazing qualifying lap. It might be the shoddy physics that can see a racer on your inside pull off a life-threatening low to high move across the course for no reason at all, slam you into the wall, then go on to set a lap record as if nothing had happened. Or it might be that the entire pack has slowed to a crawl in a dirt race because one guy who is 15 seconds ahead of them turned too quickly and drifted slightly, causing them all to be scared. If it isn’t any of those things, maybe it’ll be the basic skill levels of your opponents which, even on the most difficult setting, seems to vary wildly from lap to lap. On one turn around, the leader will drive like Richard Petty, and on the next, it’s more like you’re racing against a digital version of me. In an under-maintained and grocery-laden Toyota Prius. With bald tires. And an exhaust that’s held on by duct tape and prayers. Most likely, though, your breaking point will be when you notice the woeful damage system that sees cars being unrealistically robust to the point that every driver finishes every race, every time, no matter how many times they should have—at the very least—blown a tire. Not only that, but the recovery system is nonsensical. At one point, a nine-car pile-up ahead of me with ten laps to go saw an opponent get sandwiched between two runners, pop up into the air, fly across the full width of the track and wind up landing in the infield on her roof. Had the driver stuck an arm out of the window, she could have high-fived her boyfriend who was watching from the pitlane, given how far the car was from the track. Even with such a monstrous crash and with no caution flags in sight (I’ll get back to that) she somehow finished the race in third place. What’s more jaw-dropping is that the crash caused no visible damage because—oh, you’ll love this—the entire visible damage model was randomly removed in the PS4 version by the day one update. So, at the time of writing, every car finishes every race without so much as a scratch or dull spot on the paintwork. The game’s bizarre implementation of the rules of racing need questioning, too. Turn and drive the wrong way around the track, causing dozens of head-on collisions for an infinite amount of time and you won’t receive any punishment at all. Dare to break the pit road speed limit by a single mile per hour for a millisecond, and you’ll get a penalty. Tap into the wall slightly on one lap without spinning or causing a dangerous situation, and the caution flags come out. Miss your line totally and roll your car multiple times like you’re trying to break the world rolling record and they won’t. The inconsistency leads to a lot of the game’s decisions feeling almost random. In a game that’s seemingly attempting to provide a simulation of a sport that often consists of making a powerful car turn slightly to the left a few thousand times, the nuances of racing are important to keep things interesting. If you’re fighting it out to get to the podium and are in 4th place, you want there to at least be a chance that one of that front three might blow a tire, spin, suffer a penalty, blow a gasket, or run into problems when a backmarker causes trouble ahead of them. But none of these things are ever likely to happen in NASCAR Heat 3. Heck, if you do see someone spin or crash without your intervention—which has happened approximately once in my entire time with the game—you’ll usually find they’ve somehow magically got themselves out of the predicament and are back racing in the 16 seconds it took you to get around another lap. You’ll often run entire events where absolutely nothing of note happens, to the point where you may as well just be racing against the clock. The lack of titles competing for the NASCAR crown these days means that we need to look at other series-focused racing games when trying to make comparisons. Codemasters’ F1 2018, for example, has a convincing damage model, realistic race weekends, challenging AI that can still make result-changing mistakes without looking broken, visible damage, a working and logical penalty system, historical events, and reasonably compelling online play. While it has some good ideas that are well-intentioned and will surely provide some entertainment to die-hards, NASCAR Heat 3 is missing all those things and, in the wider scheme of racing games, is still several laps behind. NASCAR Heat 3 review code provided by the publisher. Version 1.01 reviewed on a PlayStation 4 Pro. For more information on scoring, please read our Review Policy.